As we all know by now, when Michigan and Notre Dame tussle this fall under the lights at the Big House, both squads will be wearing throwback uniforms. While no official releases/photos have made their way out of either camp, that has not stopped anyone from speculating what the throwbacks will look like. This comes from the Detroit Free Press who had this to say about the image. If this Michigan football jersey looks like something Bennie Oosterbaan or another Wolverines star from yesteryear might have worn, well, that's the point. Michigan's jersey, according to a sample provided to the Free Press, will be modeled after the image shown above. A small number also will be added to the upper-left corner of the jersey front, opposite the Adidas logo. As you might expect, Greg from MVictors points out that Bennie O didn't wear anything resembling those uniforms. 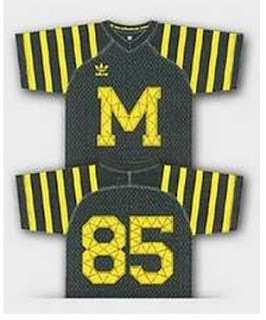 Greg also points out that the arm stripes, especially ones as obnoxious as these, had never appeared on any Michigan uniform at any point in history. Brian from mgopanic says the time is now for your eyeballs to melt from their sockets. Rest assured, when the official release comes from UM media relations, we'll have that posted here within minutes of it landing in my inbox. Until then, resist the urge to accept this image as truth. Consider the source folks. I think it's a good idea to have this kind of design. Maybe they can put some tweaks to it before they release it.